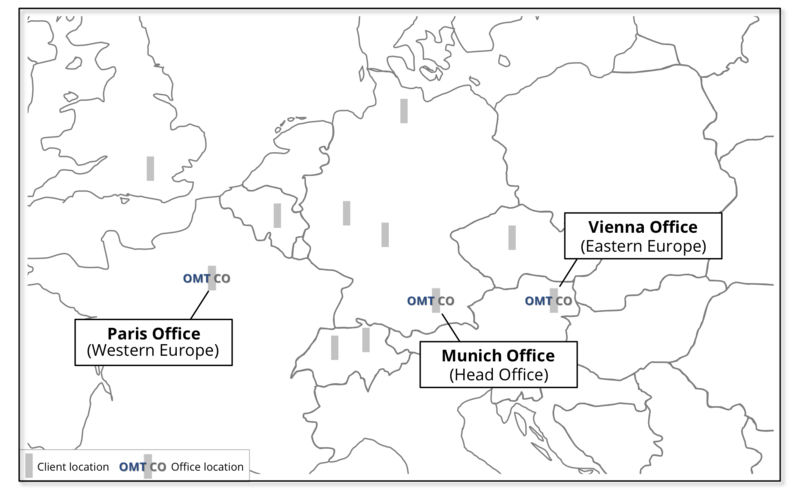 OMTCO´s primary locations are its clients’ premises, in Germany and in Europe. Our major clients are located in Germany, France and Switzerland – in Bonn, Darmstadt, Frankfurt, Hamburg, Mannheim, Munich, Paris and Bern. Furthermore, we support clients all over Europe – e.g. in Brussels, Dublin, London, Prague and Vienna. From our office locations in Munich (head office), Paris (France, Western Europe, Northern Europe), Vienna (Eastern Europe), and Zurich (opening), we advise international companies in various industries and provide our backbone support services.